"Norwich's last remaining traditional tobacconist will be closing down in the New Year because of a fall in demand for its specialist smoking products." "manager Keith Garrard says he will continue to supply his customers - and, he hopes, recruit some more - by selling his more choice wares online." A sad end to 2009. 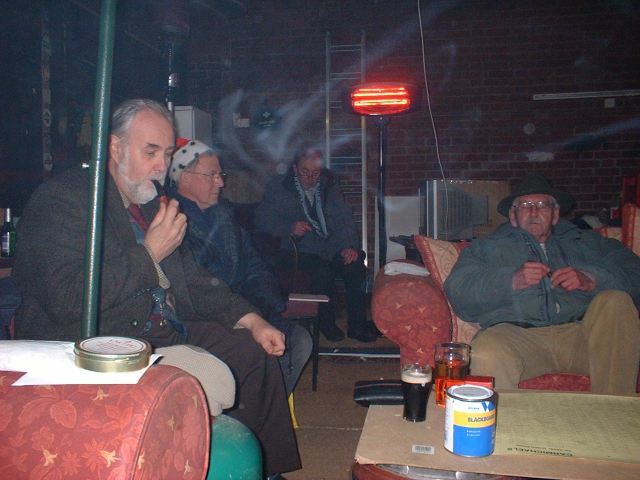 In the bleak mid-winter we met in the (freezing) shed for the Xmas draw and buffet. In spite of the cold, a most enjoyable evening was had by all - especially John Eason and the secretary who managed to scoop more than their fair share of prizes. Christmas Draw time, and a fine seasonal buffet was on offer for a cold winter's evening. 41 prizes were up for grabs for those lucky enough to be drawn out by the Chairman. The top prize winners were John Eason and The Secretary, with seven winning tickets each (pause here for gasps of surprise). 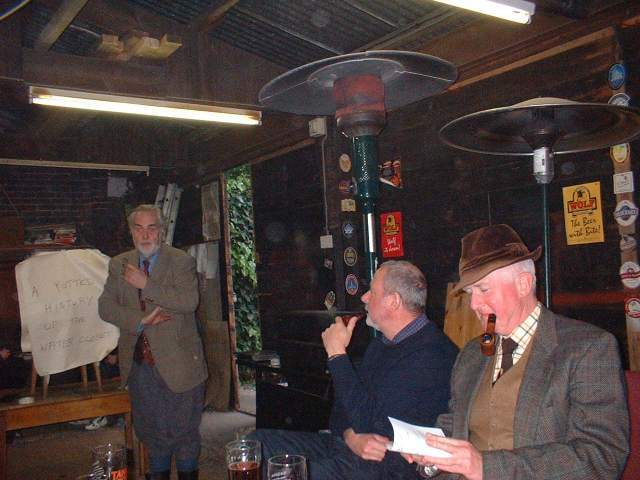 Among the array of prizes were a pipe rack lovingly constructed by Tony Larner. 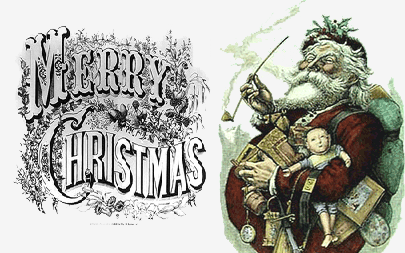 There was also an excellent Meerschaum pipe, a Rattray's selection box of tobacco, Christmas puddings and a mystery prize (since gorged by said JH Eason. I hope it gave him pleasure). Shaun was born on 2 January 1929, in Northern Ireland. He joined the RAF band at an early age, taking his B flat bass to several countries worldwide before setting in North London, where he worked for the Decca Record Company. 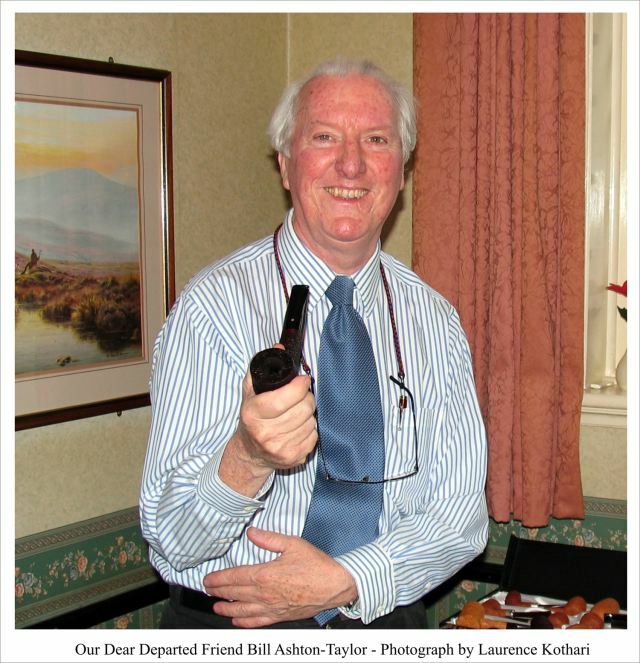 In 1966 he joined HMSO, working in the Accounts Department in Wembley. Dispersal to Norwich brought promotion to Sovereign House Cashier. 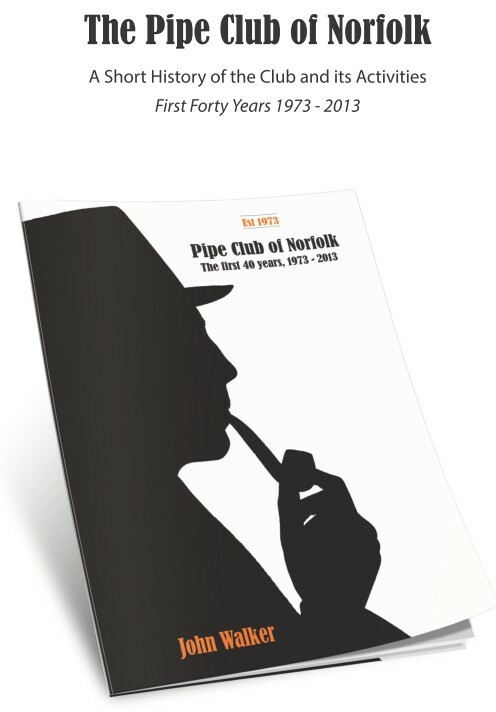 He was a keen pipesmoker, being a founder-member of the Pipe Club of Norfolk in 1973 and becoming the first Treasurer and subsequently Secretary and later Life President. Neighbours to his flat in Pelham Grove were often entertained by his post-Mill Tavern serenades played on his electronic organ. An excellent selection of cheeses from the stall on Norwich market obtained by John Eason and assorted pickles brought by individuals made for a gastronomic feast. Frank's home-made pickled onions were excellent and the Bombay Duck flavour pickle brought by John Walker went down surprisingly well. Tony, who donated a rather unusual Norwegian cheese that tastes like fudge, won the "Name the Pipe Shapes" quiz and received a 50gm tin of tobacco. The annual cheese and pickle evening, for which Ann Eason organised the cheese, KJ the crackers and butter, and various members the pickle, including pickled Bombay Duck, which was probably more palatable than last year's Pickled Mudfish. Some very tasty cheese was on offer, including a Blue from Norfolk. The Secretary had organised a quiz with cryptic clues leading to pipe shapes. The winner was Tony 'Brainbox' Larner. 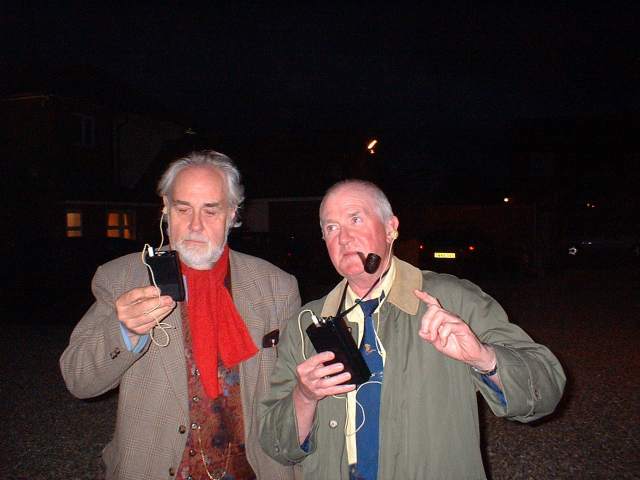 Many moons ago members of the Pipe Club would take part in 'The Chairman's Tour of Historic Houses.' This seems to have died out, probably because we're all too old and knackered. Nevertheless, I think we ought to have another go. I suggest a tour of Prince of Wales Road - we could take in some "Filthy House" at Po Na Na followed by a greasy kebab at El Greco's (other brands are available). Of course we will need minders - a recent government survey says that all the best minders are named John. We'll be fine then. We have to leave this room to smoke. 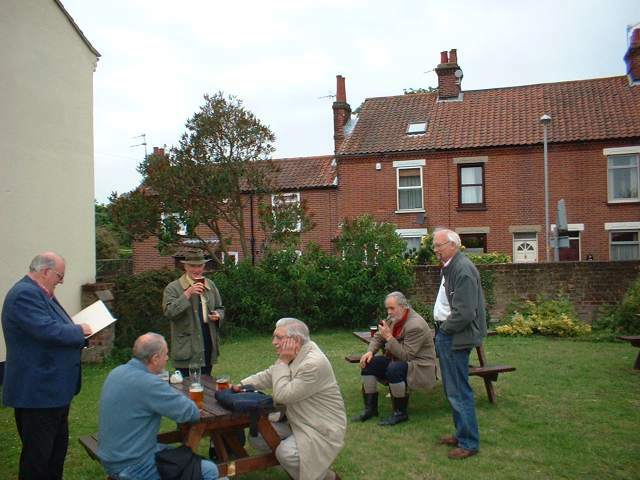 One of our members recently attended a 1940s weekend at the North Norfolk Steam Railway. Standing on Weybourne station he attempted to light his pipe only to be told 'you can't smoke that here.' I would imagine that in the 1940s there would have been more than one pipe smoker to be seen at Weybourne station. Then the steam train in all it's glory pulled into the station billowing clouds of (you guessed it) smoke. A bad blow for us 'oldies' is the news that Terry Wogan is to give up his breakfast show on Radio Two, but don't despair as his place is to be taken by Norman Evans. I wonder if he will be broadcasting from behind the garden wall? More useless surveys :- More people understand the theories of Professor Stephen Hawking than can explain what ladies see in Russell Brand (survey by Confused.com). Redheads have the most trouble with their drains (survey by Plunge-Oh Drain Rods). Most people prefer not to fill in surveys (survey by me in my local pub). 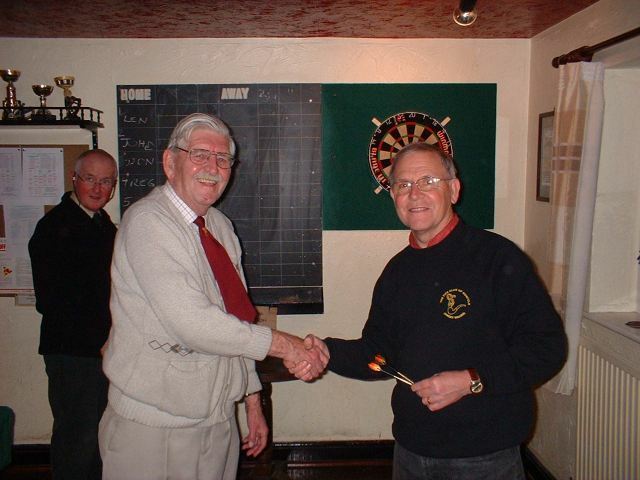 This year's darts was won by Len as usual with Don winning the highest scorer prize with a score of 114. 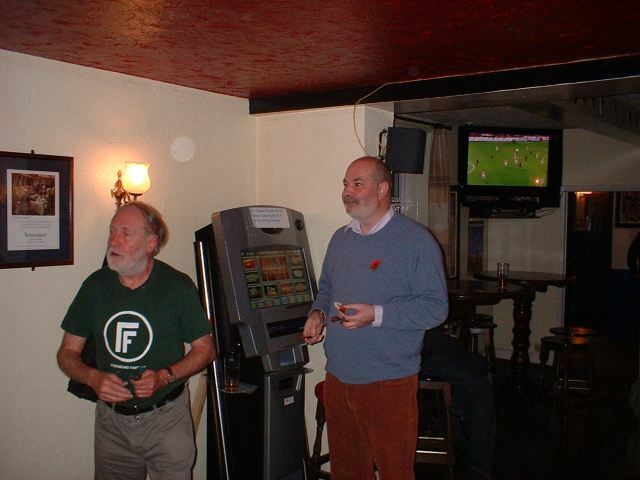 This year's Darts Night was held at The Nelson, and meticulously organised as ever by KJ Coleman. Seven participants (Messrs Coleman, Ellis, Elvin, Larner, Walker, Walker and Warman) played four games of 501 each, against different opponents. 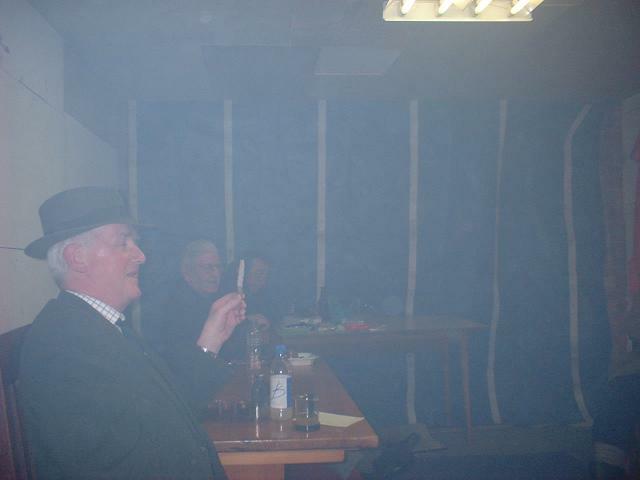 Len Ellis emerged as victor (he doesn't only win at Pipesmoking contests, you know) and tied with Tony Larner for highest score (100) during the match. However, Don Warman scored 114 in a post-match 'Friendly.' Would this count? Is there danger of another Dartsgate? No. Don has relinquished all territorial claims. The evening ended with a most welcome plate of complimentary sandwiches. Keith Coleman won this year's clay competition - his first victory in the clay. A clay pipe smoking contest smoking 3 grams of Samuel Gawith's Scotch Cut Mixture in a variety of strange shaped clays. True to form John Elvin was first out in 2:11, but surprise surprise Len Ellis was next to go after 6:15. John Walker eventually finished runner up with 37:33 leaving Keith Coleman with his first ever clay pipe victory in 40:35. 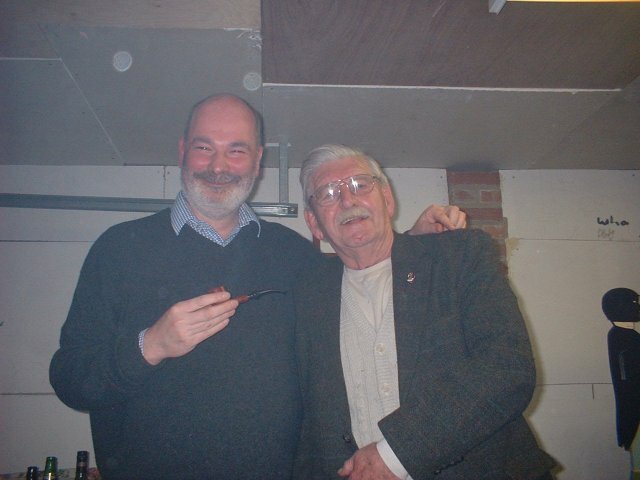 Keith was presented with a Churchwarden pipe and sandwiches rounded off a good evening. Sampling of Squadron Leader, Firedance Flake and Full Virginia Flake accompanied by an excellent quiz compiled by the Secretary. John Eason won the quiz with 16/30. With questions like "Name a four letter game that begins with a T", "What was Harold Wilson's middle name?" and "What did the slogan 'Watch Out There's a Humphrey About' advertise? ", who could have expected a higher score? Answers: Golf (groan), Harold (first name James), milk. 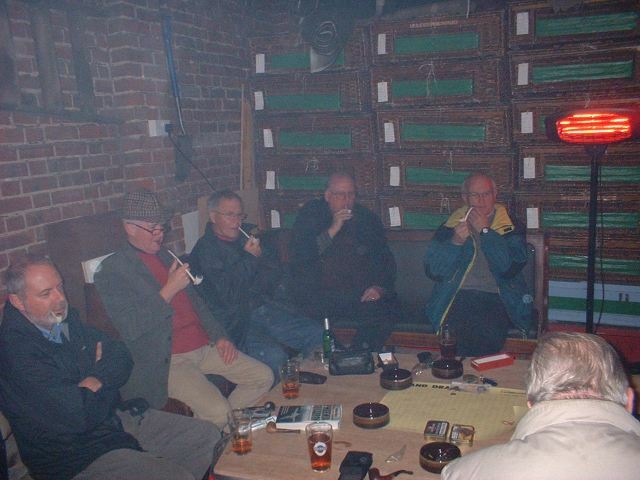 A tobacco sampling evening tasting the wares of Samuel Gawith & Co. Ltd. On offer were, Firedance Flake, Full Virginia Flake and Squadron Leader. The Secretary organised a 30 question general knowledge quiz. The questions covered a large range of topics and were generally fairly easy. 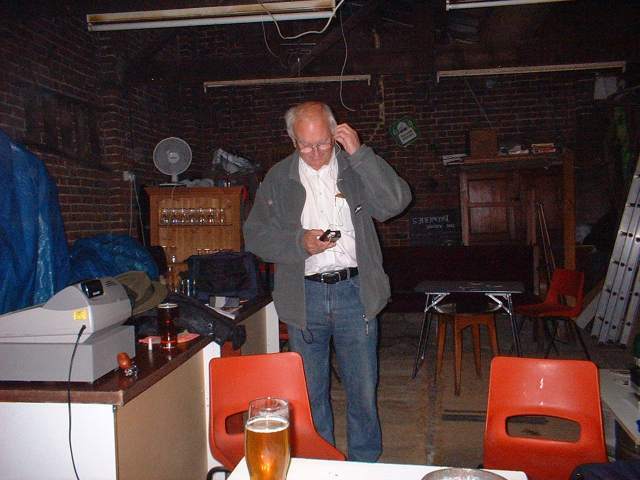 The winner was John "Egghead" Eason who was presented with a tin of tobacco. It was with some trepidation that a select band of the intellectual elite of Norwich gathered in the grounds of the Nelson P.H. - months of sleepless nights spent perusing volumes of reference books were about to be put to the test. It was the first time that many had not had a cold towel wrapped around their heads for many weeks, and John Walker had felt the need to replace the headgear with a lucky baseball cap that he claimed had been worn by Einstein when he spent some time in Norfolk almost a hundred years before. Looking at the state of it, we believed him, indeed some noticing that it had been washed at some time in its long history thought it might have been the one worn by Archimedes when he had his Eureka moment in the bath. Anyway, all of us expected our intellects to be tested to the full, but what we did not realise was that we were about to find out why the Hon Sec finds it so difficult to sleep at night and why he has a haunted look at all times. In short, he is a man with a guilty conscience. At least, I would like to think so, for it is difficult to imagine that a man who spends a few minutes each day posing as a respectable shopkeeper could devise such a range of fiendish and devilish questions as we were about to face. Of course, one expects one's mental faculties to have faded with age, and mine could not match an obscure closing line with the entertainer Jimmy Durante, even though I had seen a programme on the said Schnozzle only a few weeks before. But the old long-term memory was still in full working order, hence First of the Tudors? Henry VII- 'A' Level 1960; the London station with the most platforms? Waterloo- Eagle Diary 1953: QED. But alas, what young innocents like myself don't expect are Booby traps like 'who was the first Yorkshire Captain to tour Australia?' Hutton? No., Cook and 'which four letter game starts with a 'T' ?.......golf! And another thing to remember in such circumstances is 'Always trust your first reaction.' And a second one is 'never trust a man who claims he is an Irishman.' So when I put down potato and cabbage as the ingredients of Colcannon, I should not have listened to Reg 'I've got an Irish passport' Walker, who piped up with 'it's called Champ in the North of Ireland' So I should not have altered cabbage to onion, but there it is. I did. Mea culpa. So to the final reckoning, and I am pleased to say that notwithstanding the above, the winner by a whisker from Einstein Walker was me. And a prize of a death-causing but legal substance in a tin was well received if not well deserved. And to conclude I will put a little question of my own, i.e. 'what is it that the Hon Sec, yours truly JH Eason, and Adolf Hitler have (or in the latter's case had) in common?' The first correct answer will earn a bottle of red. Answers to the Hon Sec, who is ineligible for the competition, as are entries from Argentina. The amazing sum of £69 was raised from this year's auction of recycled crap valuable collectibles. 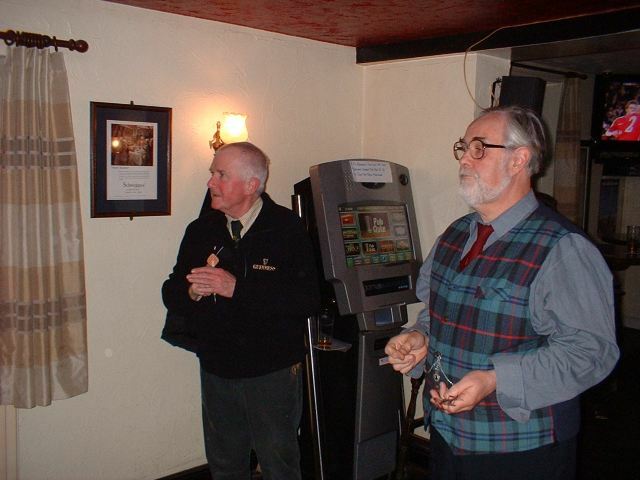 The picture shows auctioneer Reg Walker giving someone with more money than sense Tony his auction win. 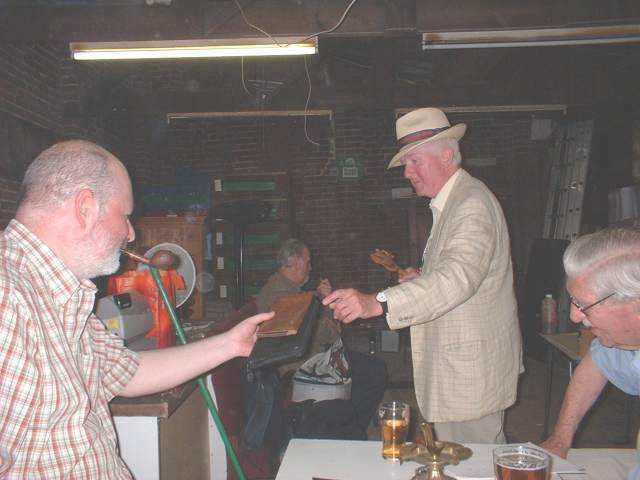 An auction night was held at the Nelson. Members brought along their unwanted tat - sorry, that should read 'treasures'- and it was all put under the hammer. Our regular antiques expert Reg "cheap as chips" Walker acted as auctioneer and pipes, pipe racks, leather goods and even a set of bowls were auctioned off. The total profit for the night was £69 which considering the low attendance was not too bad. Buy a coffee to take away and on the container you find the words "Contents may be hot" a bag of salted peanuts will warn you "May contain nuts". The wackiest one I've seen was on the back of a small box of raisins, it read "Try tossing over your breakfast cereal". There is a wonderful shingle beach down in Sussex which has a large yellow notice with a pictogram of a man falling over which warns of "an uneven surface" and just yesterday I read of a school sports day where the parents were not allowed to attend "because of safety risks". When my sons were at school it was considered a parents duty to attend the school sports, in fact I once ran in the dad's race, I think the term used in horse racing is "also ran". I started playing bowls over forty years ago and a fair number of the greens I played on were attached to a public house, how I miss wonderful greens like The Jubilee, The York Tavern, The Garden House and The West End Retreat, the old boys would turn out dressed in waistcoat and trilby and many still played with wooden bowls. Now we are expected to turn out in a uniform of white shirt and grey trousers, I'm never sure who we are supposed to be impressing as we never have any spectators. The latest trend in the world of bowls is the non-smoking bowling green, I played on one recently deep in the Norfolk countryside in the middle of a field, where the first thing you encountered was a large notice which announced "No smoking on the green". 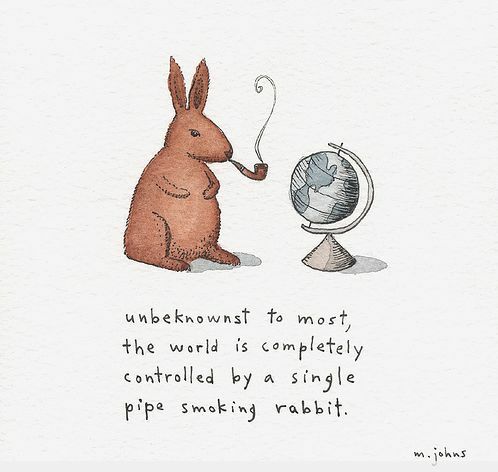 How can a skip concentrate on his game without his pipe? I notice some pipe tobaccos have crept up over the £10 mark for 50 grams, those by Ashton and Rattray's in particular. Never mind, I remember saying that I would give up drinking when beer went over two bob a pint. I see that the Food Standards Agency has spent loads of taxpayers money and come up with the recommendation that chocolate bars be reduced in size by one fifth. This is to save us all from getting to fat. I remember when Nux bars were the size of house bricks and Wagonwheels were as big as saucepan lids. I'll have TWO Mars bars please. By the time you read this you will have missed my surprise birthday party, to which you were all invited. Not much of a surprise really, as I read about it on Facebook two weeks before the event. I now have a bus pass which must make me an "oldie". What a boost to us oldies it was to see Tom Watson almost win the Open Golf Championship and even better to see Arthur Daley winning the World Diving Championship. Splendid weather for this year's bowls match with our friends at the Morley Club, Sheringham. Once again Tony arranged a bowls day at the wonderful Morley Club in Sheringham, we were greeted by our hosts and divided into blocks. Eighteen ends of three wood triples followed which was very entertaining, the novice bowlers making up for their lack of skill with large slices of luck. (A Typist writes: does anyone else smell a whiff of sour grapes around here?). After three hours fighting the infestation of Ladybirds we retired to the clubhouse for a well earned drink and a splendid buffet. A very nice day: here's to next year. The first event not to be graced by my presence was the Outdoor championship held in the garden of the Nelson on the evening of the fifteenth of July. This, of course, was the night before the first day of the Second Test at Lords, so while I was forcing myself to plough through a three course dinner at our favourite Italian Restaurant in Soho, the hardier amongst our brethren were enduring the worst that our local insect life has to offer while smoking the latest lot of sweepings from the floor of Churchill's. Needless to say, the winner was our Club Chairman, Len Ellis. 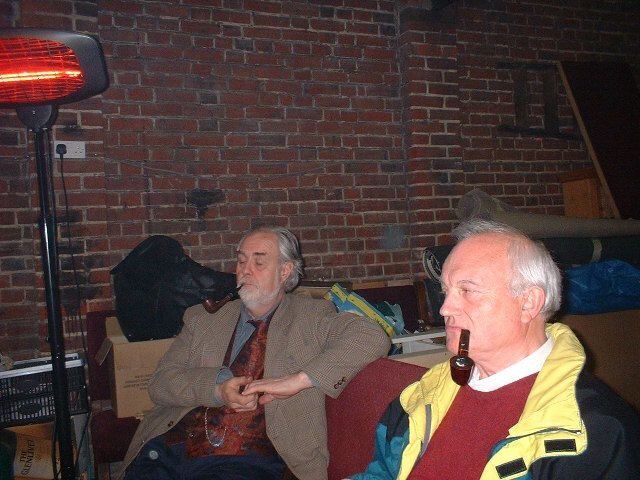 No doubt the prize was a beautiful and rare pipe. I'm guessing there, of course, but what is fact is that the Landlord of the Nelson generously provided sandwiches for all. And so to the Annual Bowls Contest, held in Sheringham on the afternoon of the second of August. This was the Sunday of the Sheringham Carnival, so naturally the town was deserted and parking freely available. Not . So perhaps it was just as well that I had been struck down with the Lurgy and was unavailable to leave my (especially strengthened) armchair, which was conveniently placed next to the downstairs cloakroom. As for the bowls (the game, that is, not the ones of which I was making frequent use) the main action centred on a Titanic Struggle between the Untouchables (Keith 'The Cheetah' Garrard; Tony 'The Adder' Larner and the ultra-competetive KJ Coleman and the Innocents Abroad (Reg 'Sobersides' Walker; Frank 'Batman' Gurney-Smith and Beryl (who had had a career in the HQ of the NAAFI in Kennington). Be that as it may, she certainly seems to have galvanised her two team-mates in much the same way that Dora Bryan did to Kenneth Connor in Carry On Sergeant. No sooner than this report have been filed, yet another missive from The Tapir thudded onto the mat. This time it reported on the Vice Chairman's week-long visit to The Prairie. Not the American theme-park, but a holiday-let house in Sheringham. Mention of Co-Operative Street, Dave's Fish Bar (purveyor of the finest Jumbo Sausages known to man), The Windham Arms, Poppy's (canine) hair and grooming parlour, Sheringham Launderette( home of the largest duvet machine in North Norfolk) and the sardines in Ted's Fishmongers were eerily factual. Ever felt that you are being stalked? Len won the annual outdoor 3gms competition and added another pipe to his collection. John Walker was the runner-up in a close finish with John Betts. A lovely warm summers evening on the lawns of The Nelson was the setting for our 3rd. annual outdoor pipe smoking contest. 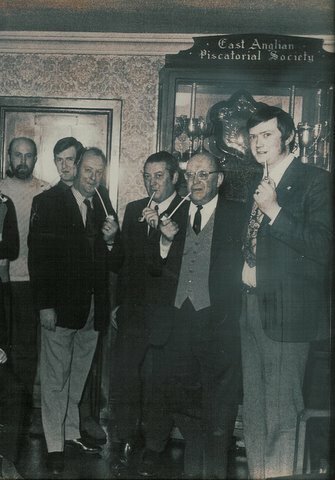 Three grams of Kentucky Nougat was smoked in the contestants choice of pipes, John Elvin kept up his recent run of form by going out after only 3:20, after Keith Garrard expired on 43:13 only three contestants remained. John Betts achieved a podium position after 45:20 and John Walker finished runner up with 45:40, the winner was Len Ellis (surprise, surprise) who managed 51:45. A tray of sandwiches arrived which was a very nice gesture from Steve our landlord. A fascinating talk by Frank on bats. After having bats roost in his house, Frank studied the creatures and, being an electronics engineer, built his own bat detection devices. I never expected to stand in a pub car park at 10pm listening for bats but that is what we all did. Sadly, no bats made an appearance. Perhaps there are not enough belfries in the neighbourhood. 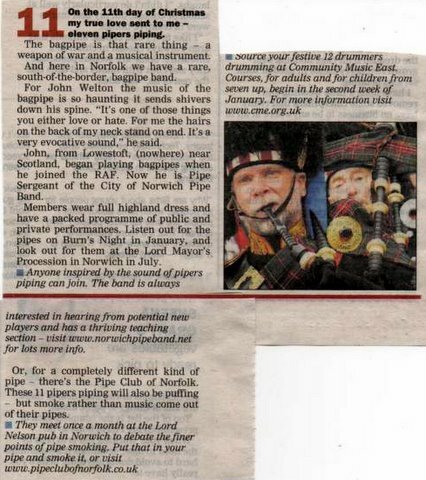 'It was indeed a select band that gathered at The Nelson for the June meeting. Some apologies had been received (A. Larner cooking books; K Garrard over-indulgence). Taking advantage of the Hon. Sec's absence, and mindful of his failure to supply either raffle tickets or prizes, a motion of censure, no-confidence and automatic re-election for a further five years was passed nem con. We then settled down to listen to Frank Gurney-Smith tell us about bats. 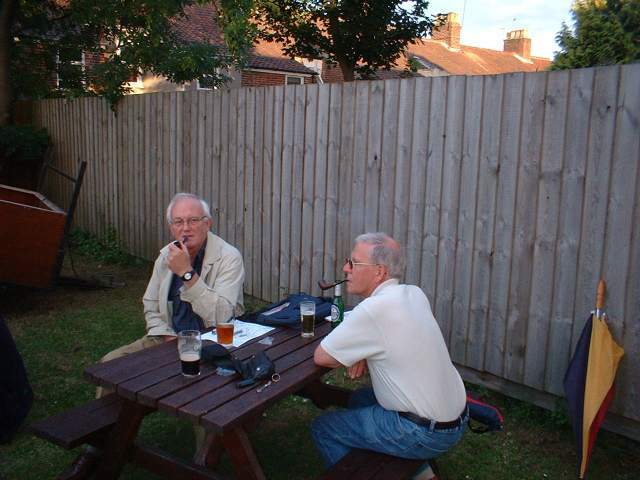 Of course, the pre-meeting drink in the pub gardens had enabled us to tell all the jokes about Batman and Robin that have ever been invented, so we were all ears as Frank began. Frank's first encounter with bats came about when the little darlings moved into his porch, with all the associated disadvantages: noise; mess; smell. But his initial diagnosis of mice proved to be wide of the mark. When he realised that he did indeed have bats, he decided to wage electronic warfare (although, dear readers, you must remember that bats are protected and must not be disturbed). Anyway, the FGS Universal Bat Detector and Deterrent Mark One was developed and seemed to work, since the bats quickly disappeared. However, Frank soon realised that he was on a journey of discovery when the bats returned the following year. What he had was, he learnt, a nursery roost, which is only occupied for a short time, and may or may not be used the following year. But now his interest was aroused, and he is now able to relate numerous bat facts- e.g. the number of species in Britain (16, of which 10 can be found in Norfolk); their habits (messy) ; sizes and weights (small and light); and the secrets of their radar-like echo location system. Personally I have always enjoyed watching bats swooping around in my garden at twilight time, and that enjoyment will be greatly increased now that I know they each devour thousands of bugs each evening. Readers of The Oldie (a fine magazine in the style of Punch, obtainable from all branches of Churchill's Tobacconists) would have been interested in the article written by Frank Keating in the June 2009 edition. He reminisced about the first Test Match he watched, in 1949. England's captain was Freddie Brown; New Zealand's was Walter Hadlee. He takes up the story: 'the jam-packed throng applauded the two men out to the middle and back again - both captains clamped between their teeth a briar pipe, from each of which there billowed whacking great theatrical brumes of smoke. Brown's bulbous-bowled convex artefact was a dramatic Holmesian thing of curly splendour; Hadlee's a more prim, straight-shafted object of polished briar- but one primed, it must be said, to belch just as much cloudy cumulus as Brown's roaring-forties swankpot's job - Like their captain, Bill Edrich, Godfrey Evans and Reg Simpson were pipemen. So was popular roly-poly Black Country leg-spinner Eric Hollies, his burning-bowl furnace, I remember still, letting loose particularly pungent and rip emissions. Ah, was this my first ever Condor moment? 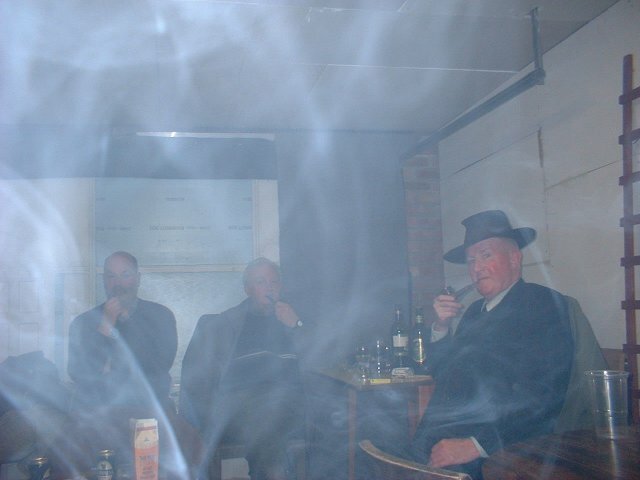 - Of that historic all-dancing, all-smoking first XI of mine - all bar one made it into their seventies - three are still with us: Brian Close (Woodbines: 78); Trevor Bailey (Senior Service: 85) and pipesmoker Reg Simpson, 89. Happy days. Wednesday 17 June: to be announced. But given it is the 66th anniversary of the birth of Barry Manilow, perhaps we should have a tribute night? I have a costume that would just fit KJ Coleman, and I know he is word-perfect on the songs... and movements. An interesting talk by Keith on the history of sanitation. When one thinks of the great movements of history one thinks of Genghis Khan and his Mongol hordes pouring across Asia and Europe, or the opening up of the American West, but Keith Coleman's thoughts turn to the smallest room in the house and to the development of what is surely the greatest contribution to urban civilisation: the water Closet. He began his talk by pouring cold water on the myth that ascribes the invention of the modern toilet to Thomas Crapper, and having given a brief outline of toilets in ancient and mediaeval times he came to the Elizabethan age, when Harrington's Jacques was the first flushing toilet that we would recognise as such today. This design was improved by the locksmith Joseph Bramah, who solved various problems, but who managed to imprison two old ladies and give rise to a popular song. After further improvements by Jennings (all the rage at the Great Exhibition of 1851 at a penny a go). The Valveless Closet of 1870 was made in glazed ceramic, and was a further step towards the sanitary ware that we know today. Unfortunately it used a massive four gallons per flush, and needed a greener approach. Hence Humpherson's Washdown Closet of 1884, which used only three gallons a go. Even greener, though perhaps slightly smellier, was the reverend Moles' Earth Closet of 1860 (pause for joke about 'Beyond the Pail'). 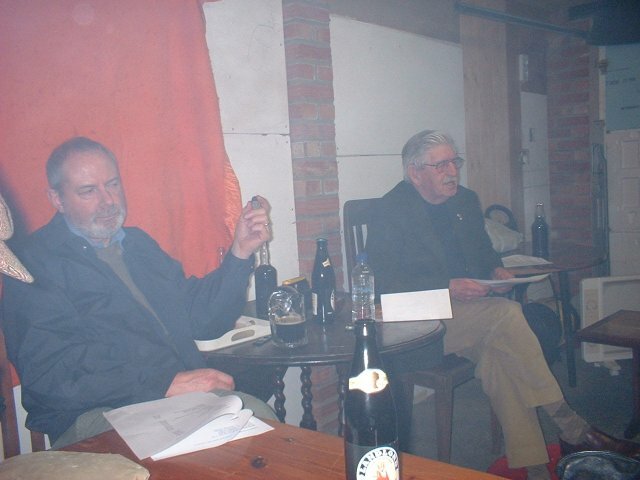 The meeting was then thrown open to members' recollections of various holes in the ground in southern Europe and of Swedish two-seater earth closets. 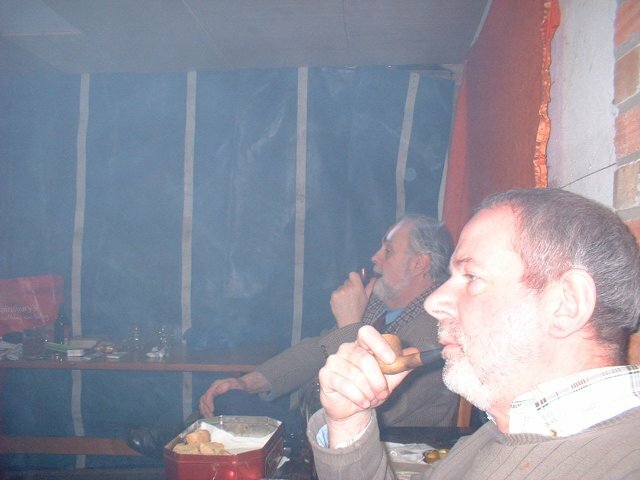 All this was a far cry from the bowl at Brooklands about which Keith has spoken to us before, and from those we are used to filling with tobacco. But surprisingly interesting, as the Actress said to the Bishop. Thanks Keith. John Betts won the annual 4 grams (with no rules in particular) competition. This was John's first competition win for some time. Everybody achieved very creditable times. 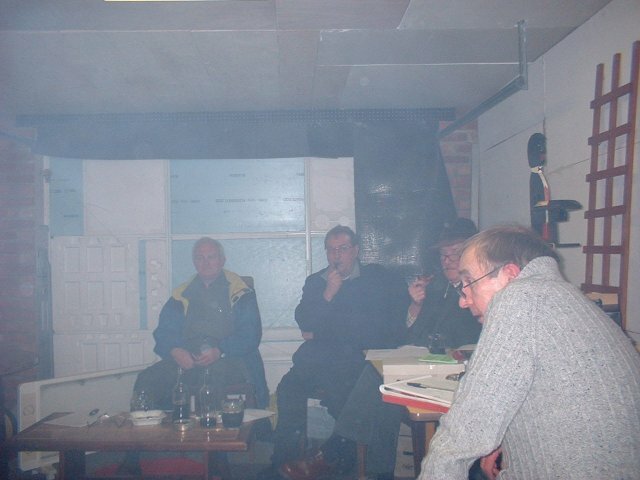 This was our first meeting at the shed, Norwich. After a drink in the outside smoking area we wandered across the car park to the large shed (sorry, Customer Facilities Unit). The winner on the night was John Betts who recorded a time of 64:58 and was presented with a Hardcastle Pipe for his efforts. Frank Gurney-Smith finished runner up. I am overjoyed to report that the Secretary won his first raffle prize of the year. It can be viewed- and indeed purchased- at a discounted price, on the middle shelf of the locked cabinet in a certain Norwich retailer. 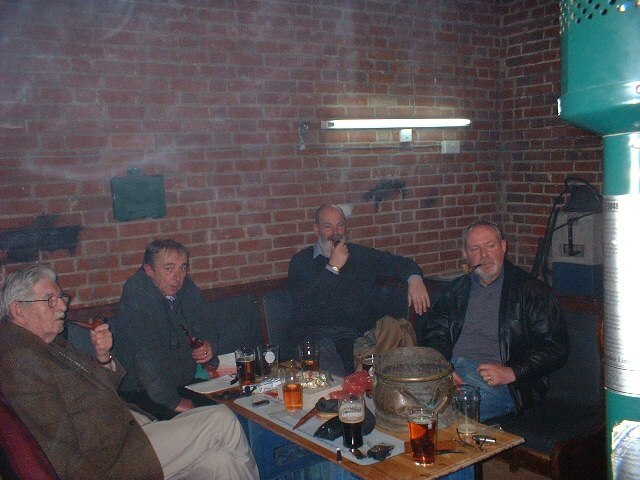 An occasional bit of fun - the cigar smoking competition. 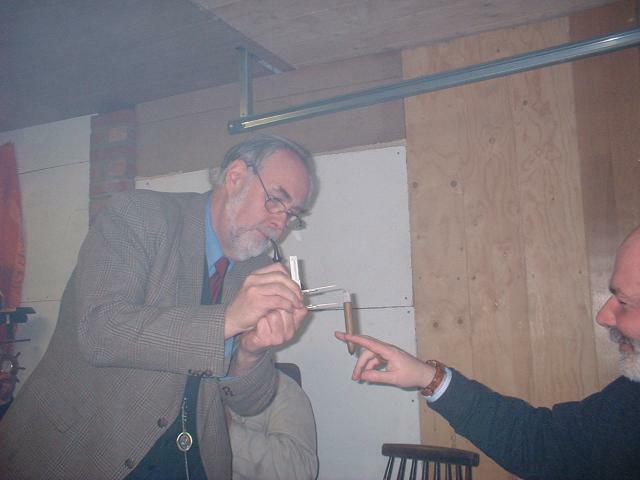 King Edwards kindly donated by Tony were smoked to see who could develop the longest ash. 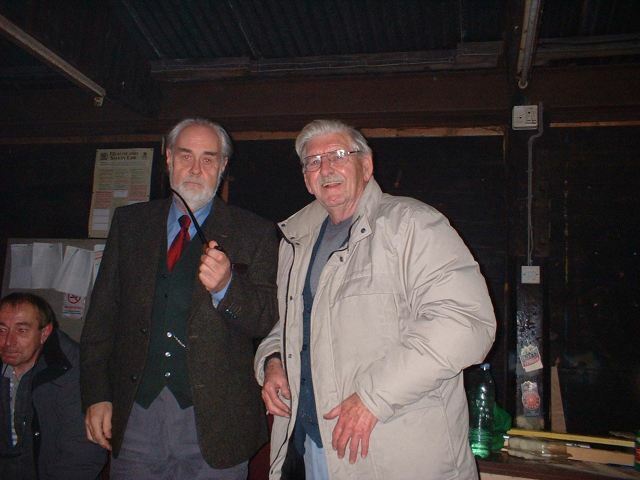 Chairman Len and vice-chairman Reg were the joint winners with a creditable three inches. At the end of the competition, each participant received a "Certificate of Length". 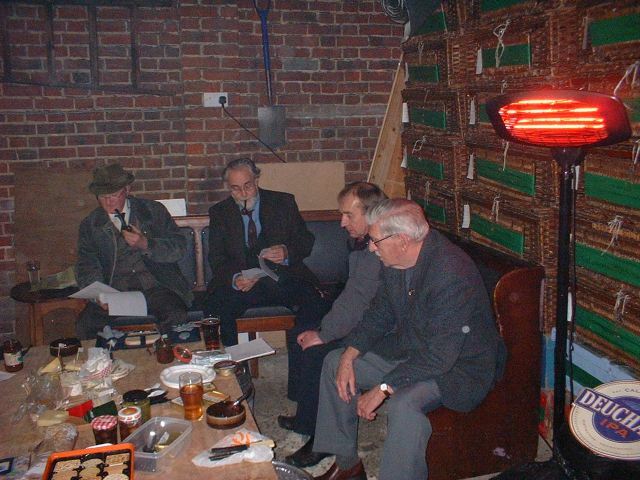 'Report of the All-England Cigar Smoking Contest held at a secret location somewhere in Norfolk. 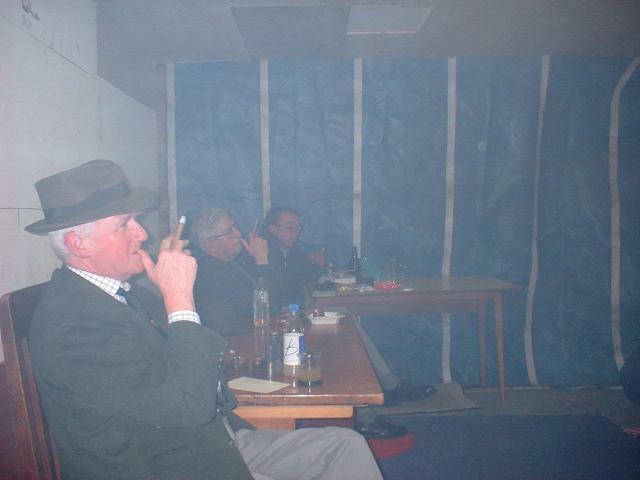 For those readers unfamiliar with this event, each competitor is issued with a quality cigar and is required to achieve the greatest length of ash (as determined by the referee's precision measuring tool) within the time limit. If one may use a cricket analogy, while a Pipe contest may be compared to a Test Match the cigar version is a limited-overs knockabout, with all the action and excitement compressed into a relatively short, hectic period. The line-up consisted of Garrard, Ellis, a brace of Walkers, Warman, Betts and Larner. 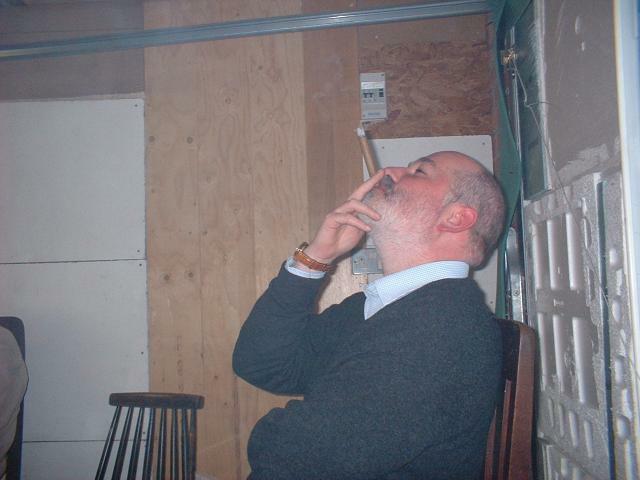 All the competitors adopted the Vertical Method, whereby the cigar is held upright and smoked from below. This provides the column of ash with the greatest surface area upon which to rest but does increase the chances of 'compaction;' a phenomenon whereby at a certain stage the ash no longer increases in length and sometimes shrinks. Various theories have been offered, from gravitational pull to settlement similar to that occurring in packets of dried goods. No doubt someone will be able to provide a scientific explanation. 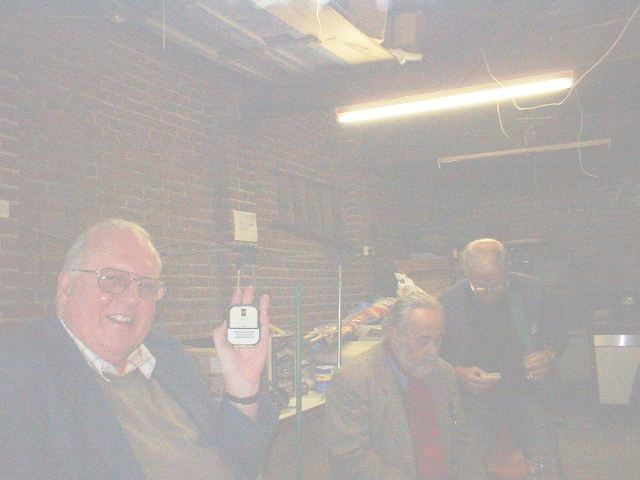 We would like to thank Tony Larner for his kind donation of Quality Cigars, and KJ Coleman for his meticulous work on the callipers. Tony Larner won the annual 3 grams briar competition, which is the most prestigious PCN competition on the calendar, with a time of 51 minutes. This is the first time that Tony has won the 3 grams briar since joining the club in 1992. Well done, Tony! Many thanks to KJC for the excellent sausage rolls. 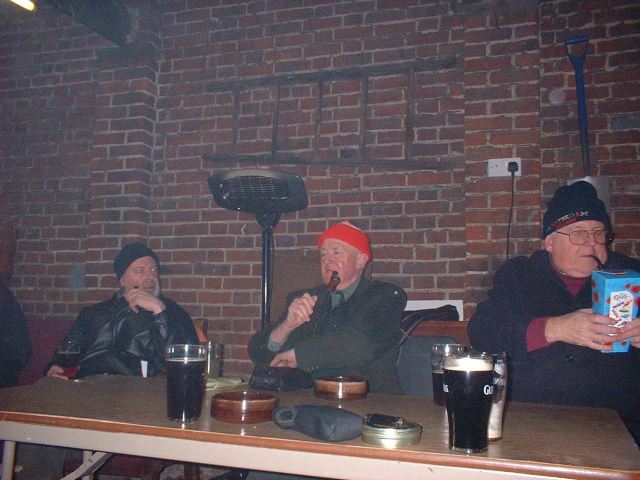 The Annual Club Briar-smoking Competition was held at The Smokeasy with three grammes of Bosun Cut Plug being smoked in pipes of the contestants' choice. Keith Garrard did not really get going and was out after only three minutes. Three people went out soon after the 40 minute mark, leaving Len Ellis to battle it out with Tony Larner for the gold medal spot. Len recorded a time of 44'50, leaving Tony the winner with 51'50. 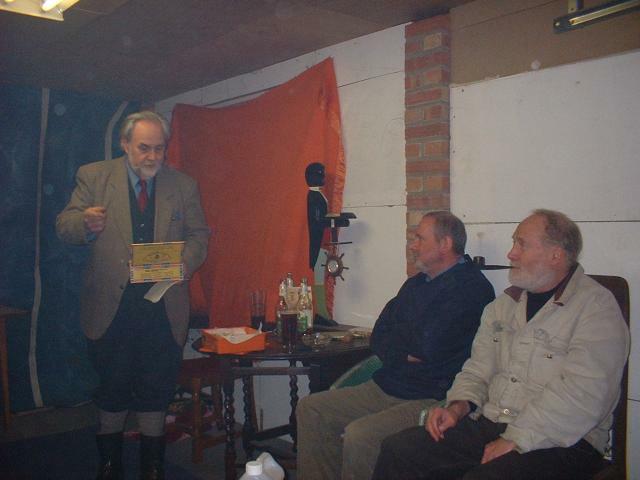 The winner was presented with a pipe and the runner-up a tin of tobacco. John Walker's atmospheric photographs of this prestigious event appear on the PCN Website. 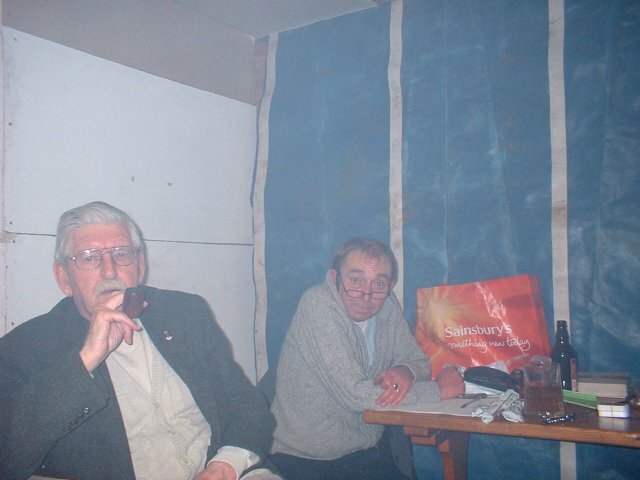 The 2009 AGM at the SmokeEasy saw the club in optimistic mood in spite of all the difficulties caused by the smoking ban and by our usual meeting venue, the Rosary Tavern, closing down. The Rosary Tavern closed at the beginning of January and we shall have to wait and see if it reopens. However, we now have contingency plans in place to deal with every eventuality. Our situation is helped by the fact that the club is on a sound financial footing.